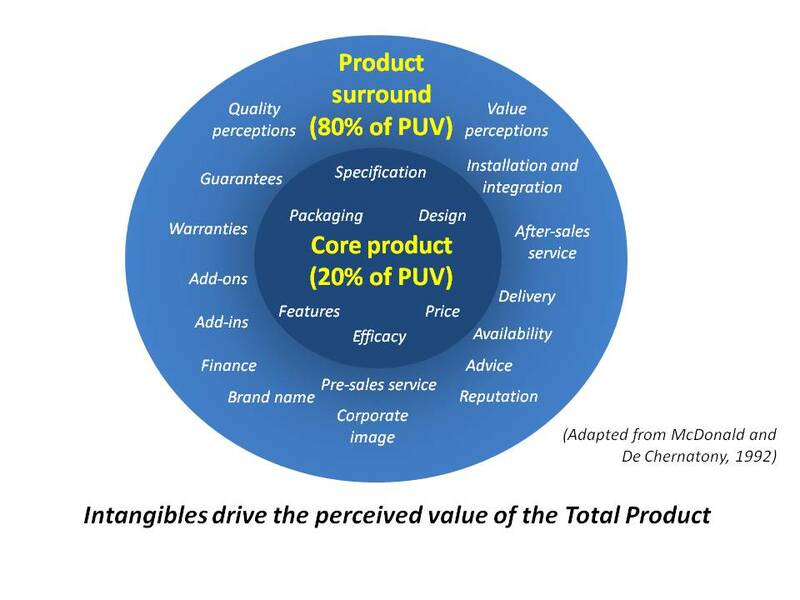 Even in B2B markets the value customers place on products is substantially determined by intangibles such as service rather than core product characteristics like specification or price. In ‘Creating Powerful Brands’ (a classic book for marketing strategists first published in 1992, now in its fourth edition) McDonald and De Chernatony suggested as much as 80% of a product’s impact, or Perceived Use Value (PUV), may be accounted for by intangibles in the product surround, rather than the core product itself. The combination of the core product and its surrounding intangibles is usually referred to as the total product. This concept can be combined with analytical methodologies to quantify these effects (see article on perceived use value). For businesses operating anything other than a pure direct sales model this means most of what their customers value is either being delivered, or is highly influenced, by their channel partners. What is more, the intangibles include elements critical to the life of the company such as corporate image, reputation and perception of quality. Mistakes in channel partner recruitment and management can inflict far more damage on a company than a few lost sales or refunds to settle complaints. Poorly performing channels can tarnish a company’s brand image in a market for years, causing loss of share that may never be recovered. It is common for businesses to test perception of their corporate and product brands in their markets, and many will conduct this by key target segment. However, it is still relatively uncommon for companies to do this by channel and still fewer involve their channel partners in such measurements. When this research is conducted carefully with partners it can generate strategic gold. Tracking end customer perceptions can help identify poorly performing partners but – much more importantly – it can also identify areas where the company needs to work with different types of partner to deliver the total product required by each market segment down to individual customer level. Managing activity in the market based on what customers really value, rather than what we think they want, pays dividends.